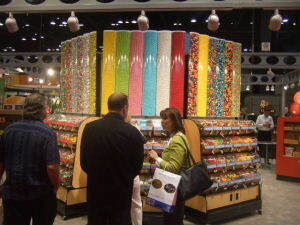 I remember walking into the Expo and just being amazed by all the candy around me. Everywhere you could see there were bowls of samples and servers handing out products. It was like walking into a Walmart stocked only with candy, and all of it was free. 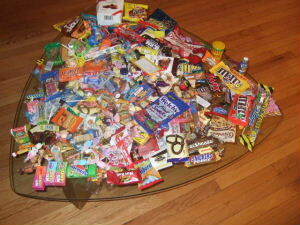 This seemed like the adult version of trick-or-treating, and before I knew it, I had already filled up a bag. Throughout the three-day event, there were sessions exploring various components of the confectionery world, but I tended to skip them as most were geared toward distributors and buyers, and frankly, do you really want to know why chocolate is a solid product to invest in during a recession? Yeah, less talkey and more free candy givey. So for three days my routine consisted of traveling the various areas of the show floor, mingling with the people running the booths, and filling bags upon bags with candy. Aside from the major candy distributors, there were smaller companies, foreign companies, and gourmet companies. One of the best perks of the show is that you really do get to eat any piece of candy you always wanted to try. Often, I find myself in a supermarket staring at scores of products I want to try, but I simply donâ€™t have the stomach/wallet to consume them all. At the Expo, all you had to do was approach your booth of choice and suddenly you could consume anything you wanted. The coolest moment of the show occurred on the third day. 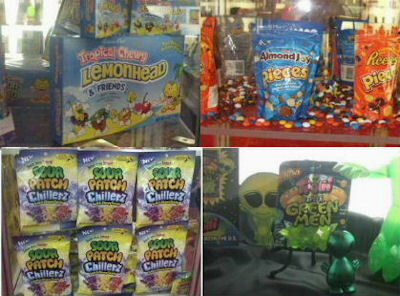 You see, each booth constructs elaborate displays of their products and theyâ€™re just filled with all sorts of candy. None of the people working the booths really want to take all this candy back with them, so on the third day youâ€™re essentially allowed to grab whatever you want… crazy, I know. 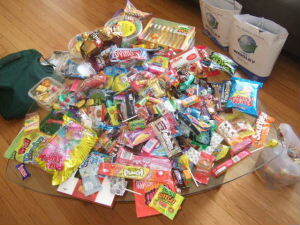 So how much candy did I grab? Well, after three days of hoarding as much as humanly possible (keeping in mind I had to take the Red Line up to Andersonville every day with my haul), the gross weight was 72 pounds! Thankfully, my awesome friend Jason, whom I was staying with, graciously accepted all the candy I couldn’t carry back with me to Austin. Landrin Waferatto: I honestly didnâ€™t want to like these. These couture chocolates are inspired by fashion prints and are supposed to appeal to women via beautiful packaging, so I assumed they would skimp on taste for presentation. I couldnâ€™t have been more wrong. These delicious wafer truffles with a hazelnut center surpass even Ferrero Rocher. Chowardâ€™s Mints and Gum: Iâ€™m not really a mints or gum guy, so I was surprised to find myself in love with this small company. They produce staple flavors, such as peppermint and spearmint, but they carve a niche for themselves with an elegant flavor of violet gum and mints; truly unique, complex, and refreshing. VerMints: Again, hereâ€™s another product I thought would disagree with my taste buds. However, what makes these so tasty is the nuanced flavors they offer consumers. My favorites were the GingerMint variety, which tasted like gingerbread, but the CafÃ© Express was great too. 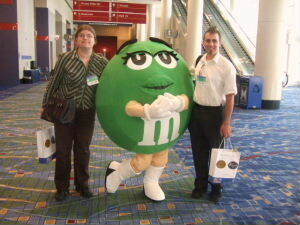 Gimbalâ€™s Cherry Lovers: The Gimbalâ€™s booth people were just some of the nicest people on earth. They just kept giving me samples and samples of all their different products; however, the one that stood head and shoulders above the rest was their Cherry Lovers confection, a bag of heart-shaped cherry gummies consisting of nine different cherry flavors. Albanese Confectionery Gummies: Iâ€™m sure Albanese has great chocolate and whatever else they were offering at their booth, but the sad truth is that I was so impressed with the gummi line that I filled up on them before I could even get to the chocolate. Seriously, these are just some of the best youâ€™ll ever try, particularly the sour ones, since the sour component is actually mixed in the gummi and isnâ€™t just a coating. NewTree: This high-end, small company wowed me as my favorite of the gourmet products I tasted. Their Belgian dark chocolate is infused with black currant, apricot, and lavender, among other flavors, all of which succeed in remarkable fashion. Great observations – love you photos too! I agree that these sorts of shows are a great way to taste the diversity of candy out there, especially those items that you’re not as likely to pick up at the store for whatever reason. I can hardly wait to try the Landrin Waferatto and Gimbalâ€™s Cherry Lovers. Your photos are great!